Are you running a blog and writing blog posts every day? I can imagine how tough it can be for you to find out right keywords to get high traffic for your next blog post. Especially, If you are a beginner and just started your own blog. There are many tools which can help you to do the same thing but all of them are paid and as a beginner, you can’t afford them. So, I have one tool for you. I am sure you are aware of the tool called Google Keyword Planner (formerly known as the Google Keyword Tool). Everyone does because this is the first need when you come into blogging. When you plan anything to write on your blog, the first thing you do is find keywords which you target to get organic traffic. Google Keyword Planner is the first choice for the people who need a tool for keyword research and don’t have money to invest in premium tools. And mostly beginners can’t afford to invest in buying such high costly tools, So Google Keyword Planner is the best option for them. This is the first tool which I started using for my need of Keyword Research. Because when I started blogging at that time I didn’t have money to buy premium tools for Keyword Research. In my initial days of blogging, I didn’t have money to invest. So, I had only one option to choose which was Google Keyword Planner, because this is a free tool for Keyword Research. Google Keyword Tool is designed with the Advertiser in mind. So, that’s why it has some great features like keyword bidding. So, today’s post will help every beginner to know how to use Google Keyword Planner? and as result, this will help you to find best targetable keyword for your next blog post. How To Use Google Keyword Planner For Keyword Research? Using Google Keyword Planner is not a tricky task. It is very simple to use and find keyword for your blog post. I will show you how to use Google Keyword Planner to find out the right keyword for your business in some steps. You can easily find Google Keyword Tool just by searching it in Google search box. Simply google it, and you will get it as the first result as shown in below image. As you know Google Keyword Tool is a Google Product like Google Adsense, Google Analytics, YouTube and others. And I’m sure you also know that all Google products can be signed in using one Google Account. So, for signing in it you need your Google ID, that’s it. After signing into Google Adwords, You have to find where Google Keyword Planner tool is. You’ve successfully signed in to Google Keyword Planner tool and now you can start your keyword research. Keyword research is basically a process to find the audience to target for your product or service or the content you are writing. Here audience means, people who are interested in buying the product or service you are offering, or people searching for the solution you are writing a blog post about. Let’s take an example here, I am writing about Google Keyword Planner tool and guiding my readers like you about how to use it. So, I need to find what people are searching who wants to learn the same. And for this, Google Keyword Planner tool will help me. It will show me the Keywords, Phares, Queries people search on Google. Find New Keywords: As its name already saying… This tool will help you to find new keywords for your product, service or the topic you are writing about. You should choose this tool when you don’t have any keywords data for your research. URL: This is for Adwords users but sometimes it can be a good option for finding keywords related to your business. You can enter URL related to your business and it will give you keywords. Get Search Volume and Forecasts: This tool will not help you to find new keywords as the first tool does rather it will help you to know the search volume of keywords. This tool is useful for you if you have a long list of keyword or file(Yes, you can upload a file too) and you only want to know their search volume to ensure that how they will perform in future. You can paste all the keyword or upload file for which you want to get search volume and forecast data… After pasting or uploading the file click on Get Started button and you will get same Result Page as you will get in “Find New Keywords” tool. You will get a result page(like shown in below image) when you click on Get Started button of any Tool to get Keywords or Keywords Data. Keyword Text: Imagine, you don’t want to see Keywords ideas which contain any specific words. You can filter them out and keep all the keywords you want, it will help you to choose your keywords more easily. Competition: This is showing Adwords competition, how hard this keywords to rank for. 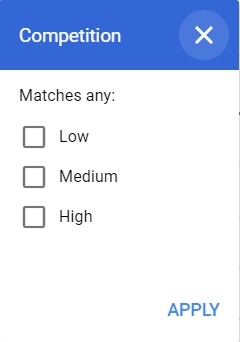 Google Keyword Tool shows you keywords with “Low”, “Medium” or “High” competition, you can filter. Top of Page Bid: The is how you expect to pay for your ad to appear at the top of the page for that Keyword. Top of Page Bid is a proxy indicator of commercial intent. So if you only want to target keywords that potential buyers search for, you can set this to a certain dollar amount. Organic Impression Share: This is how often your site appears in the organic results for each keyword. Organic Average Position: This is where you will rank in Google Organic. How To Choose Keywords To Work On? 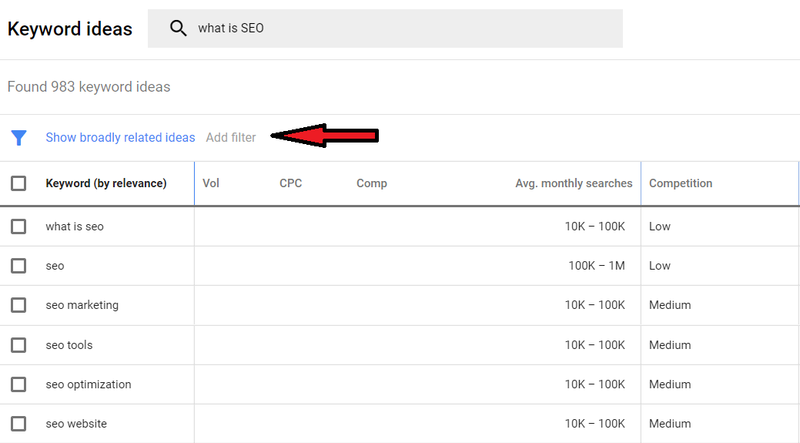 Now you know how to use Google Keyword Planner tool for keyword research… But do you know how to choose keywords which will you get on result page of GKP? Search Volume: The keywords with higher search volume always has the potential to drive huge traffic to your website. So, Always go for the high search volume keywords. Competition: This is the main factor which you can’t ignore… Competition shows how hard it can be for you to rank for a keyword, So Always go with the Keywords which has Low Competition. CPC: CPC means Cost-Per-Click, it is another an important factors in Keyword Research. It shows how profitable a keyword is… Always choose keywords which have high CPC rate. How To Find Exact Search Volume Of Keywords? But, how to get exact search volume? If you have a running active Adwords campaign. But I can help you to get exact search volume without having an active Adwords Campaign. #1. Select any single keyword which you want to target or you want to see exact search volume of. #2. Click on Add to plan as shown in the image. #3. Then at last, click on Plan overview to see the exact search volume. You will get impressions on the next screen after clicking Plan Overview. Impression shown the number of people searched for this particular keyword in a month. This is everything you need to know for using Google Keyword Planner tool, GKP is the initial choice when you come to Keyword Research. GKP is free tool for keyword research, that’s why it is best option for beginners. I remembered the day when I just started my blog and came to know about the importance of Keyword Research but finding a tool which can fulfill your requirement was very hard without taking any charge. Because I was not able to pay for those high costly-premium tools… So, GKP was the best choice. good work. it is interesting.